Persimmons are a delicious and unusual fruit to grow on your homestead. Introduced to the United States by Japan, persimmons offer a colorful splash to your winter landscape. In addition to their beauty, persimmons provide 55% of the daily recommended value of vitamin A and 21% of the daily recommended value of vitamin C.
There are hundreds of varieties of persimmons but the most widely available persimmon in the United States is the Hachiya, also called Japanese Persimmon. It grows to 3 inches in diameter and has a rounded shape with a slightly pointed base. The Hachiya has bright orange skin which dulls as it ripens. 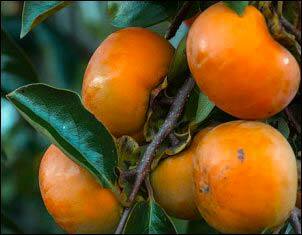 This variety of persimmon is extremely astringent and it will pucker your mouth until it is soft-ripe. At the right stage, it is sweet and creamy. The Fuyu persimmon is a smaller variety and is tomato shaped. 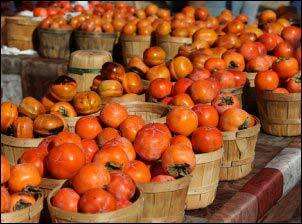 Fuyu persimmons are not astringent at all because they have no tannins. They can be eaten while still quite firm and have a crisp, sweet flavor. American persimmons are available and can bear fruit but they are generally considered ornamental. American persimmons also need both a male and female tree to produce fruit whereas Asian persimmons are self-fruiting. For prolific harvests and profitable crops, Asian persimmons are your best bet. Persimmons like a warm climate but other than that, they are not particularly fussy about their growing conditions. You can buy them from reputable nurseries to put right in the ground or you can go the DIY route and propagate them from cuttings or grow from seed. To grow from seed choose a fully ripe, unblemished persimmon. Remove the seeds and soak them in warm water for three days. Once they have soaked, rinse them under running water to completely remove any flesh. Once you have soaked and cleaned the seeds, they need a period of cold stratification. The stratification process mimics the overwintering they need to sprout. Wrap your seeds in a moistened paper towel and place in a glass jar. Store the jar in your refrigerator for three months, spritzing the paper towel when it begins to dry out. After the cold stratification process is complete, plant one seed in a tall, plastic container with drainage holes. The container needs to be tall because persimmon trees develop their long taproot very early. The seed should be planted 2” deep in sterile potting soil and placed in a bright location where the temperature is at least 70 degrees Fahrenheit. Because persimmon seeds have a 25-35% germination rate, plant multiple seeds for the best chance of success. You should see persimmon seedlings in 6-8 weeks. Keep your persimmon seedlings in bright, indirect sunlight with evenly moist soil. Once all danger of frost has passed, move your potted persimmons to a sheltered area outdoors. Harden them off over the course of two weeks by gradually moving them to an area with stronger sunlight. Water weekly to keep the soil moist, but persimmons don’t like soggy conditions, so let the top inch of soil dry out between watering. After a full growing season, your persimmon trees are ready to be transplanted into your homestead orchard. It is easiest on the transplant if this is done in October or early November, after a soaking rain. Make sure you have allocated enough space (20 square feet per tree) to ensure your persimmons have enough growing space to thrive and produce an abundant yield. Spread a thick layer of organic mulch around the base of your persimmon trees and be patient. Persimmon trees grown from seed can take 3-5 years to bear fruit. Trust me, it is worth the wait. What Can You Do With Persimmons? Persimmon trees are beneficial to self-sufficient homesteading because they are said to give maximum fruit yield per square foot. Trees can be expected to produce 35-75 pounds of fruit per season. That is a lot of fruit! They are healthy and delicious eaten fresh from the tree, but they are extremely perishable. The delicate fruit can be stored in the refrigerator for three days before they begin fermenting in their skins. Because of that, it is important to have a storage plan for personal use and a product plan if you plan on selling this fruit. For personal use, persimmons can be used in puddings, smoothies, and baked goods. Simply peel and chop persimmons. Spread chopped fruit in a single layer on a baking sheet and place in the freezer until frozen. Transfer frozen fruit to freezer bags and label. For puddings and baked goods, let the persimmons thaw before using. You can use frozen persimmons in a smoothie for a frothy, ice-cream-like smoothie. Another quick snack that makes a unique and side to all types of meat is pickled persimmons. To make these refrigerator pickles clean, peel and chop 6-7 Fuyu persimmons into bite-sized pieces. Place the chopped persimmons in a sterile quart-sized jar. Combine 1 cup apple cider vinegar or rice vinegar, ½ cup water, 1/3 cup of sugar and 1 cinnamon stick in a small saucepan on medium heat. Bring to a simmer, stirring constantly, until the sugar is dissolved. Pour the vinegar mixture over the persimmons and let it cool to room temperature before capping. Refrigerate. The next two recipes can also be made for home use, but they are extremely popular at farmers markets and specialty grocers. Persimmon Butter is very simple to make and can help you quickly work through an over-abundance of fruit. Hoshigaki is labor intensive but produces the most delicious product you can imagine that carries a price tag of $40 per pound. Peel and cut persimmons into equal-sized wedges. Place persimmons along with the remaining ingredients in a saucepan and cook on medium heat until the fruit is soft, stirring constantly to prevent scorching. Pour the mixture into a blender, or use an immersion blender, to blend until smooth. 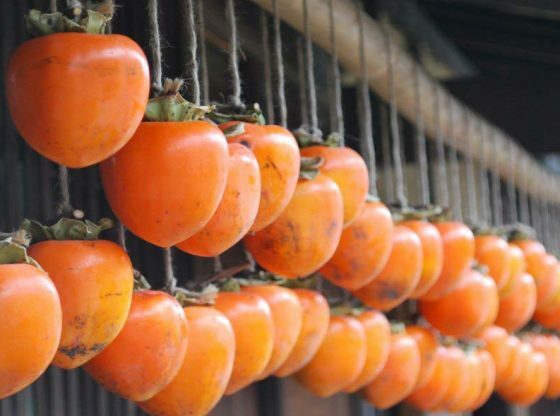 Hoshigaki is the traditional Japanese method of drying persimmons. Saveur magazine calls hoshigaki the Kobe beef of dried fruit. Making this gourmet treat is time and labor intensive, but the results are well worth the effort. To make hoshigaki, choose unblemished, ripened fruit. Gently wash and dry each persimmon. Peel the fruit, leaving the stem area intact. Tie a strand of twine on each stem. If there is no stem, you can carefully insert a small metal screw into the cap and attach the twine to the screw. Hang the persimmons in a bright window, out of direct sunlight. In approximately one week the peeled persimmons will develop another skin. Once this happens gently massage each persimmon daily. Massaging the persimmons with a few squeezes each day drives away the moisture and redistributes the sugars to the exterior. In 4-6 weeks you will notice a white coating on the persimmons. This is the concentrated sugar that has been drawn out by the daily massaging. It is a sign that your hoshigaki is finished. Remove the twine and screws from the persimmons and store in an airtight container at room temperature. If you live in a damp climate, there are a couple of tricks you can use to help with the drying process. Once you have cleaned and peeled your persimmons, dip them in boiling water for 10 seconds before hanging in a bright window. Put an oscillating space heater in the area and leave it running on low until the persimmons are dried. Hoshigaki is a truly delicious and healthy snack and it makes a wonderful holiday gift. If you want to market this specialty product to high-end grocers and restaurants, I suggest you do two things: First, take pictures of the entire process. Print them out and create a small portfolio to show your potential buyer. Second, chop and dry a few persimmons in your dehydrator. Allow your buyer to sample both products. Dried persimmons are good, but there really is no comparison between the two products. If you are looking for an interesting, healthy and tasty fruit to add to your homestead, I encourage you to give persimmons a try. They are easy to grow, simple to maintain, fun to cook with, and can be profitable to your homestead business.